Dodgers Owner Files Bankruptcy To Fend Off MLB Major League Baseball recently rejected a TV deal for the Dodgers that team owner Frank McCourt said would provide financial stability for the team. McCourt then filed bankruptcy in hopes of staving off the MLB. The back side of the right-field scoreboard at Dodger Stadium, home of the Los Angeles Dodgers. 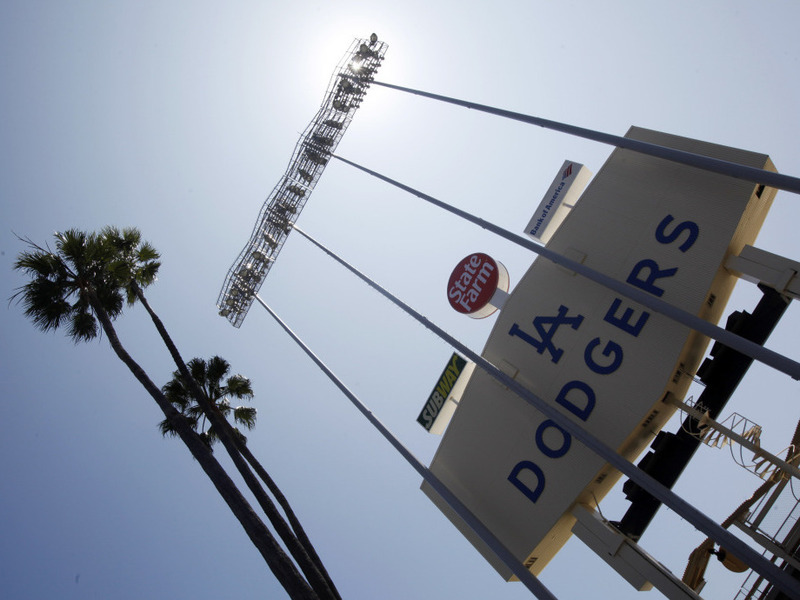 The Los Angeles Dodgers have filed for Chapter 11 bankruptcy protection. Major League Baseball recently nixed a TV deal that owner Frank McCourt said would stabilize the team's shaky finances. NPR's Tom Goldman reports that today's filing appears to be a last-ditch effort by McCourt to keep baseball from seizing one of the most storied teams in all of sports. TOM GOLDMAN: That point is one of desperation, says Marc Ganis. He's a sports business expert who runs SportsCorp Ltd.
MARC GANIS: The formal rejection of the Fox Network deal was a nail in the coffin. And he's trying to do everything he possibly can to hold onto the team. This is likely to meet with the same lack of success all his other moves have had. 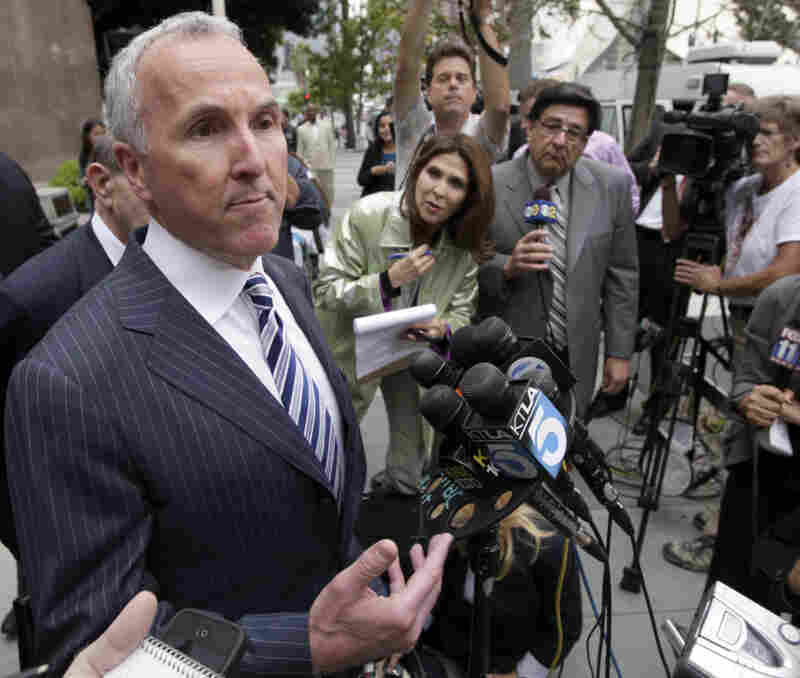 Los Angeles Dodgers' owner Frank McCourt speaks to the media outside court in Los Angeles earlier this month. McCourt cited Major League Baseball Commissioner Bud Selig's interference with club operations and refusal to approve a Dodgers TV deal with Fox Sports as the cause for Monday's bankruptcy filing. GOLDMAN: For example, Ganis says the $150 million in financing includes more than 10-percent interest. Compare that to last year's Texas Rangers bankruptcy case with interest in the three-and-a-half to four-and-a-half percent range. GANIS: So obviously the entity that's providing financing feels they're taking quite a bit of risk here. GOLDMAN: It is the latest twist in a saga that's battered the Dodgers' sterling reputation. Under the long-time ownership of the O'Malley family, the franchise was considered a model, with great moments etched in baseball history. BLOCK: Sandy into his windup. Here's the pitch. Swung on and missed. A perfect game. GOLDMAN: One-time Dodger Manny Ramirez was the quirky power-hitter who suddenly retired from baseball this year rather than face another drug suspension, and he provides the irony of the day. In the court filing, Ramirez is listed as the team's largest unsecured creditor, owed a reported $21 million, wherever he is.